Paint and Panel celebrated the shining lights of the Collision Repair Industry in their annual Paint and Panel Awards. The awards recognise Collision Repairers who are raising the bar for the Industry, focussing on innovation, delivering an exceptional experience for their Customer and doing the right thing by their teams. 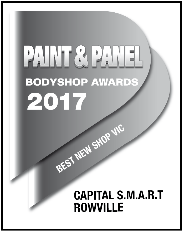 Capital S.M.A.R.T was very proud to collect the Best New Shop Victoria award for its Rowville Site, and Best National Multi Site Operator for its Banyo facility in Queensland. Jim Vais, Group Operations Director said the awards showcased the high standards the collision repair industry is now achieving, and recognised the hard work and effort put in each day by the whole S.M.A.R.T team to create a world class experience for its customers. Click here to read more about the night's winners.